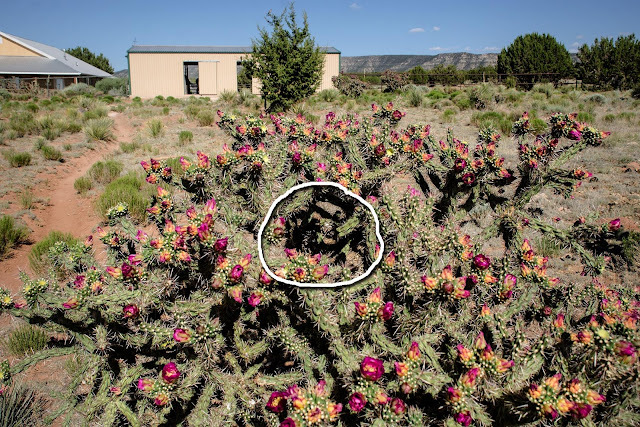 I saw a bird flailing about in this cholla cactus over the weekend. I felt sorry for it but wasn't about to stick my arm in there to set it free. The next time I walked by, all was quiet. b) impaled itself and was dead. in an even more beautiful nest – constructed in part with Hank's tail hair. I'm not sure how many eggs are in the nest. I didn't want to risk impaling myself to find out. but I'll keep checking back to see what hatches. c) do you have any Robins ? 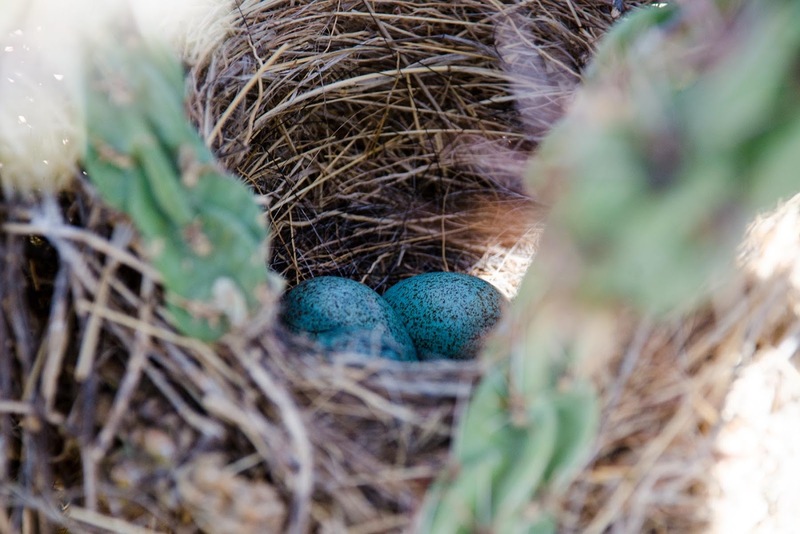 Eastern Robins also lay blue eggs, and they CAN be speckled. (the ones in my neighborhood are notorious for picking bad/precarious spots to build their nests). This one does look much more secure. wild bird eggs blue with brown spots (this option popped up as I typed the word 'blue'). ... and there are lots of variations of eggs. Apparently lots of people are curious about the species of the blue eggs. .
We currently have Eastern bluebirds laying in the nesting box. Their 2 eggs (from yesterday) do not have any speckles ... but I am sure I have seen some variation in colors over the years. Such a secure spot! I do wonder how the babies will fare when leaving the nest, but Nature usually has the best plan. Beautiful eggs! My eyes got misty over the Hank hair. This is wonderful!! Mama and her babes are going to be safe from predators in there! Those are so beautiful, like turquoise jewelry! Lovely! And Hank's tail hair....*sigh* I look forward to your updates. Smart mom with a security system in the nursery. Pretty! Brave mama to risk being skewered several times a day. Beautiful Hank will always be there. Beautiful eggs. And Hank helped. Of course he did. Wonderful Hank, always. Curve-billed thrasher is my guess for the nest. 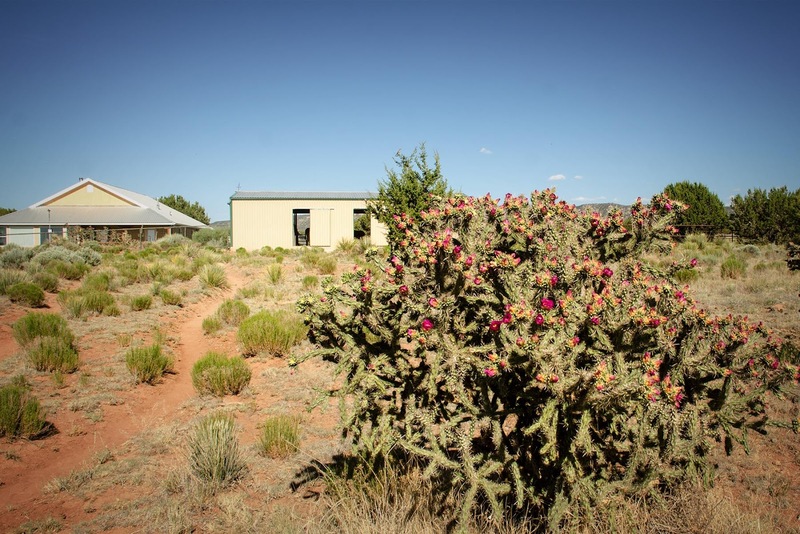 I found this: The Curve-billed Thrasher breeds in arid places with sparse scrub growth and cacti, open areas in chaparral with prickly pears, and around settlements in arid areas. 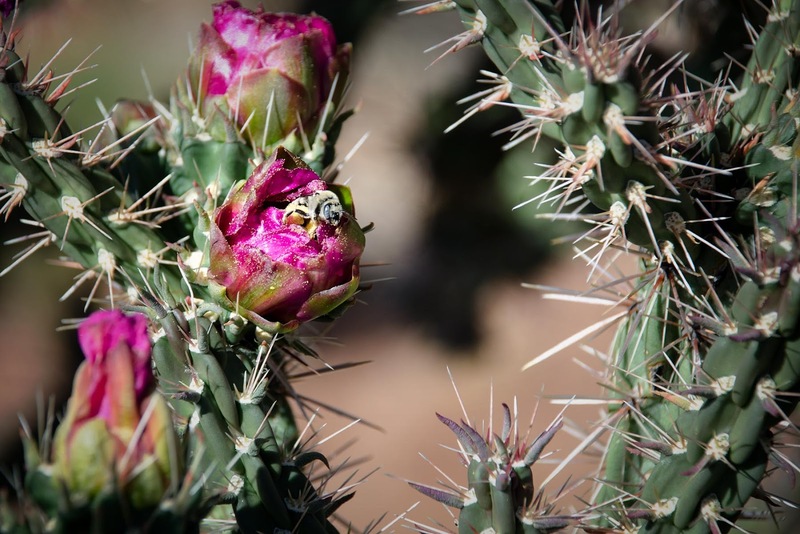 They frequently nest in cholla cactus, 3 to 5 feet up, or in low trees where they may nest up to 12 feet. These photos were sent to me by Kayla from Arizona. If you can cut away the cholla later on, I see a souvenir nest as part of your decor. How special that Hank is part of it. And I see them around here all the time - they're big! I'm surprised they haven't attacked me while I'm being nosy. Beautiful eggs and flowering cactus and memories of Hank. What a great find. I'm pretty sure that belongs to a cactus wren. It always amazes me that they can build a nest in cholla. And I might add....that is the prettiest cholla I have ever seen! Gorgeous eggs. 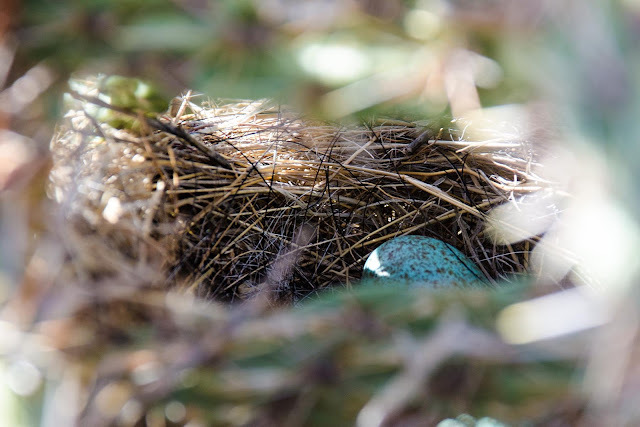 Keep an eye on the nest cause horse mane and tail hair is a real problem for nesting birds. Their feet get wrapped up and they can't get loose. We see so many tangled dead baby birds at the Thoroughbred brood mare ranch my friend manages. My first thought was, "I wonder if she'll find a way to get that nest & save it, once the babies have left home (because of Hank's tail). It's something that I would probably do - but then, my daughter say's that I'm "an emotion bomb", so maybe I'm the only crazy old bat that would. You might be able to use the eggshells for some mosaics or something later on!! I can't wait to see the baby birds, if you can get a picture of them! oush had missed this post! love but love the colours : green and pink and blue eggs. what a wonderful use of Hank's hair.